Honey, the kids are finally asleep. Fine, I’ll be the Red Shirt, but only this time!! EG Dad is partaking in NERF War with Sinister and Nefarious. Z is sleeping on my shoulder, oblivious to the noise. It would appear we DID bring the right child home. There are certain highlights of any NERF war. 1: Older siblings hold first right for strategic manoeuvres. However, as EG Dad is also an older brother himself, it is hilarious watching him wait for Nefarious to step outside the ‘shelter’ and give Sinister the all-clear before deftly making his killshot on the ‘obvious senior officer’. 2: Unless ammo is an issue, and you are 100% confident in the accuracy of your shot, you should always ‘double-tap’. Even more skilful if you can do it close-range and standing over them – to send a message to the enemy (or just your over-achieving spawnlings). 3: Always have a designated ‘Red Shirt’. 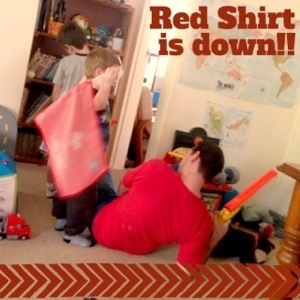 Otherwise known as grunts or younger siblings, often family warfare may lead to parents being the Red Shirts. At which point, you should remind the ‘young whipper snappers’ that Next Gen made the Red Shirts officers – and then proceed to ‘double-tap’ at close range. To send a message. NERF Wars. It’s life lessons like these that separate the spawnlings from the minions.